We finally managed to make it work. No heat wave, no prearranged social engagement and most importantly no track work planned that weekend. Yay! I was looking forward to satisfying my cravings! The plan was to eat through our hit list but share the meals so we didn't fill up too quickly. We started by having breakfast and pho was our choice. Pho Tau Bay has reputedly the best pho in town. I don't recall having been here before and it was quite a tiny little restaurant. We got there before 10 am and was lucky enough not to have to wait for a table. As we sat down, a man came up to take our order but we were not given any menus. It was quite funny because I didn't know what to call the dish outside of the word 'pho'. CW was fast thinking enough and said 'the special' please. We ordered a large bowl so we could share. I asked CW whether she knew what the special meant and it was an assumption it meant all parts of the beef like tendon, tripe, beef balls and thin slices of beef. To be absolutely sure, I went searching for the menu. There was a board near the front counter and to my relief the special was exactly what we thought. Phew! Well, what can I say about the pho? The broth was packed with flavour, yet not unctuous. I didn't feel I was drinking heaps of fat. As a matter of fact I felt I was drinking spoonfuls of goodness! A beautiful bowl of noodles, beef, tendons and a great broth which was lifted by the spikes of spicy chilli slices we consumed. So good! We then decided to give our tummy a little break and walked around the shops. Along the way, I had a feeling of being back in Malaysia. Seeing familiar ingredients such as fresh tamarind, packets of instant coffee, shelves of biscuits and confectionery. And even a coconut grater! And the abundance of street food, seafood and fresh vegetables and herbs make us consumers so spoilt for choice! Our second stop was at Tan Viet Noodle House. There were queues to dine here. We came at the right time, only 2 were ahead of us in the queue. But later on I saw about 10 people deep waiting to get a table. We had the Crispy Skin Chicken with dry style egg noodles. The chicken was yummy. Crispy skin yet tender chicken pieces. Loved the glossy look and colour of the skin. Very tempting to look at and delicious to boot! And the chilli at this place was seriously hot! I couldn't take too much of it as it was starting to burn terribly in my mouth! I think over the years I have lost a lot of my chilli tolerance having been acclimatised in Sydney. Our third stop was intended to be Dong Ba, known for their spicy beef noodle but we decided to check out Phu Quoc beforehand. The reason for this was I had read an article in the Food liftout of the Daily Telegraph that week and the article was about recommendations by chefs on their favourite cheap eats. Dan Hong recommended Phu Quoc for their great lemongrass beef or sugar cane prawns which you can hand roll yourself. We decided to share a Special Steam Rice Noodle (Ban Hoi Dac Biet) which consisted of small rice paper rolls, a big platter of vegetables and herbs such as roman lettuce, basil, mint, cucumber, pickled carrots, and bean sprouts; a platter of mixed meat such as lemongrass beef, sugar cane prawns with small bars of pressed vermicelli, fried pork rolls, Vietnamese style pork ( which looked a bit like Spam to me). And served with bowls of nuoc cam. What fun! We were enjoying putting our own ingredients and selecting our meat of choice and wrapping these cute little rice paper rolls. Yum! Loved this experience and it was a nice way to divert from the 2 previous meals of noodles. By the way, we looked around as more and more people were in this tiny place while we were eating. Everyone was ordering the same dishes as we did. This must be their specialty! After all that, we couldn't fit in another dish. So Dong Ba is put on hold until our next visit. But I did have a craving for something sweet, so we went over to the BKK international food centre and bought some lovely Thai sweet delicacies and I had a large cup of the Thai version of ice kachang! 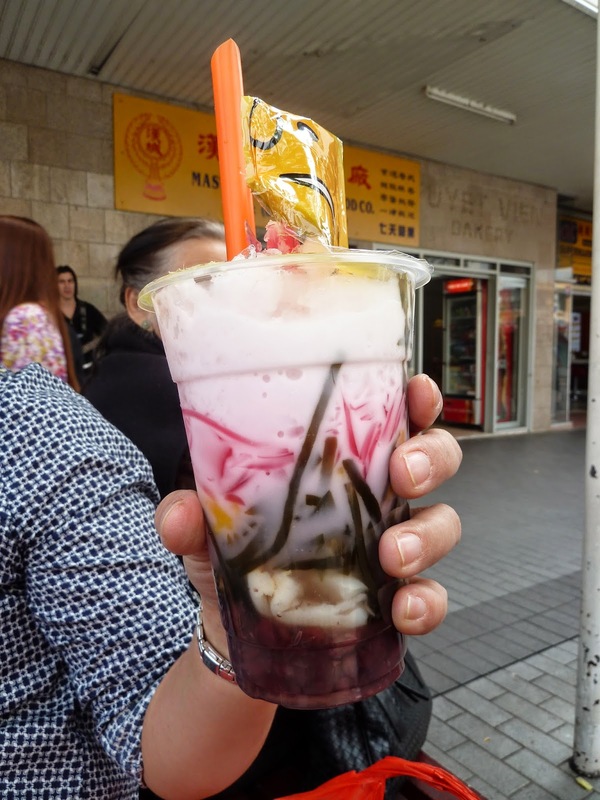 It was a lovely day of soaking in the Cabramatta atmosphere, enjoying what turned out to be glorious weather and the food and kaleidoscope of colours! What can I say but that I enjoyed every bit of it and to think there was so much more I could have checked out! A very nice thought indeed! P/S Oops! I forgot to mention that we bumped to thesuzchef as we were leaving Phu Quoc! She and her family were waiting for a table at Pho Tau Bay. What a lovely accident and it was so nice to finally meet baby Ava. A gorgeous girl indeed! cabra foodie crawl looks so awesome. loved pho tau bay and tan viet but haven't been to phu quoc yet. heard it's really good though. Love Cabra. We always end up doing a food crawl when we're here - too many good places we want to eat all at once!